I recently had the pleasure of meeting the inaugural cohort of the Momentum Fellowship, Philanthropy Northwest's program aimed at preparing professionals from underrepresented communities for careers in philanthropy. These nine fellows bring a tremendous set of skills and experiences to the table, in addition to their diverse backgrounds. Added bonus: They're quite charming and fun, and we can't wait to see them again next month. An initiative like this can't solve philanthropy's diversity, equity and inclusion "pipeline problem" all by itself, but as our board member Luz Vega-Marquis of Marguerite Casey Foundation says: "We have to start somewhere." The field is certainly ripe for this fellowship. Nationally, we're in the fifth year of D5 Coalition's 5-year initiative to advance diversity, equity and inclusion in philanthropy and the nonprofit sector overall. Locally, Rainier Valley Corps has also launched its first cohort of fellows, aimed at strengthening the capacity of Seattle nonprofits in communities of color, with support from Philanthropy Northwest members 501 Commons, City of Seattle, Bill & Melinda Gates Foundation, Loom Foundation, Social Justice Fund Northwest, Social Venture Partners and United Way of King County. From a communications perspective, the Momentum Fellowship also gives us fresh eyes on the art and business of philanthropy at six Pacific Northwest foundations: Meyer Memorial Trust, Marguerite Casey Foundation, Northwest Health Foundation, Oregon Community Foundation, Pride Foundation and Rasmuson Foundation. We look forward to publishing monthly blog posts, or perhaps more frequently as the fellows have new insights to share with our network. 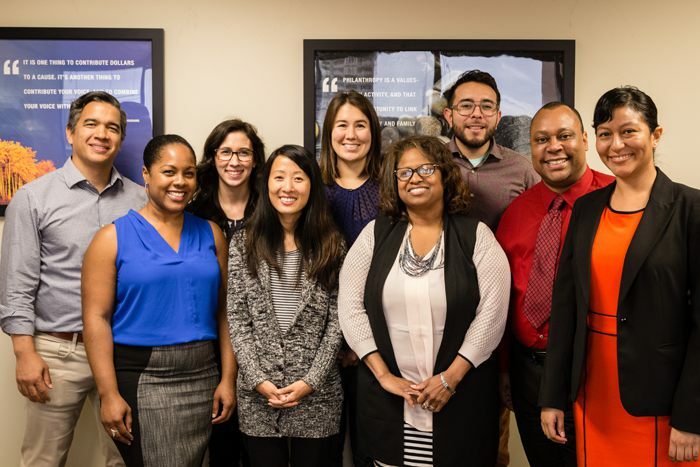 The 2015 Momentum Fellows (left to right): Marcelo Bonta, Liz Posey, Kim Sogge, Janelle Choi, Kelsey Potdevin, Sharon Wade Ellis, Eduardo Moreno, Dalian Yates and Katherine Porras. What did you learn from your first cohort meeting? Marcelo Bonta: I learned what it means to be set up for success — to be loved and supported by a network of powerful, influential, strong and inspirational group of fellows and Philanthropy Northwest board members and staff. I feel extremely blessed to participate in this fellowship. Liz Posey: About both the ancient history of philanthropy and the current history in the United States. I deepened my understanding of the current landscape of giving — it was exciting to learn that 80% of giving is from individuals, which underscores the power of our collective voices to shape the sector and our society. Kim Sogge: I learned a lot about the personal motivations and experiences of the other fellows. One thing that has stuck with me was from a couple of our guest speakers who mentioned the tools of philanthropy as more than just grants or dollars; there are other strategies that philanthropic organizations have to elevate the voices and messages of their communities. Janelle Choi: I learned how powerful it is to work with a group of people dedicated to social change, to collaborate with peers who have been through a lot and who are motivated to use their pain and life experience to create a more just and equitable society. Kelsey Potdevin: I learned many things, but the most striking was how small the philanthropic sector is! Only 20,000 people! That’s tiny. Sharom Wade Ellis: I learned that there are a gazillion people thinking about the world's problems, and fine with not being nationally recognized for their work, and yet they are making a huge difference in the lives of others through their work. The FareStart program was amazing. Eduardo Moreno: Prometheus acted against the Olympian Gods by demonstrating his love of humans and was punished by Zeus. Prometheus was then known as the protector and benefactor of mankind — the founder of philanthropy. Dalian Yates: I learned that we have a lot of folks in the sector that love Broadway musicals. Katherine Porras: I learned that each of my colleagues have strong personal commitments to equity and each of us bring a wealth of professional experiences. Many of my colleagues are talented in the musical theater realm. We could have changed the future of musical theater, but instead we will change the future of philanthropy! Visit the 2015 Momentum Fellows page for more information about each of our fellows, and stay tuned our first blog post from Kelsey Potdevin at Rasmuson Foundation. The cohort will convene again during Philanthropy Northwest's Best Practices: Essential Skills & Strategies for New Grantmakers workshop, November 12-13.